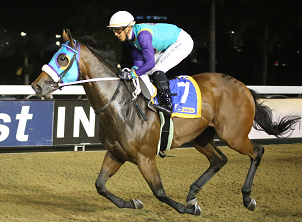 Viv Greybe: Lightly raced three-time winner Argenteus, out of Andre Nel’s stable, found one better in her last two outings, but should recoup losses at the Greyville Polytrack on Friday evening when teamed up with Gareth Wright again and contesting Race 7, a MR 82 Handicap (F&M) over 1600m. This five-year-old daughter of Silvano has a definite affinity for the Polytrack where she has won three times in just five starts – the last two of which was a fine double over 1600m and 1800m. Her next run when switched to Scottsville was a disappointing fifth over 1950m. Subsequently rested for four months, she returned with an inspiring run under 60kg – finishing second in a MR 81 Handicap at Scottsville. Then stepping up in class, the mare followed up with a gallant 0.5-length second in a Pinnacle Stakes at Greyville on grass over 1800m. With the benefit derived from that run and returning to her most effective course, she will be tough to beat. However, expect a bold bid from Robbie and Shannon Hill-trained Kilmokea with apprentice Serino Moodley up. This two-time winner comes off two promising runs with Moodley aboard – finishing second at Scottsville and then a game close second at the Polytrack over 1600m. Also in with claims is Dean Kannemeyer-trained Miss Milanna (Keagan de Melo) who has been threatening a third career win with De Melo up. The three-year-old’s most recent run when fifth was her second outing after a rest, and a much better effort can be expected. Next best are Lady Li Lay, Pearl Glow and Double ‘O’ Eight. There are two Anton Marcus mounts worth following earlier on the card. He looks poised to strike in Race 2 when teamed up with Dennis Bosch-trained Chantyman in a 1000m MR 80 Handicap. This four-year-old was in need of the run last time when second, as it was his first outing after being gelded. With Marcus taking the ride again he should go one better. Then Marcus has a bright chance of success in Race 4 when he lines up with Michael Miller-trained French Legend in a MR 76 Handicap (F&M) over 1400m. The last time this two-time winning mare raced at the Polytrack was in her penultimate outing when she ran on stoutly and finished a good one-length second in a MR 76 Handicap over 1400m.